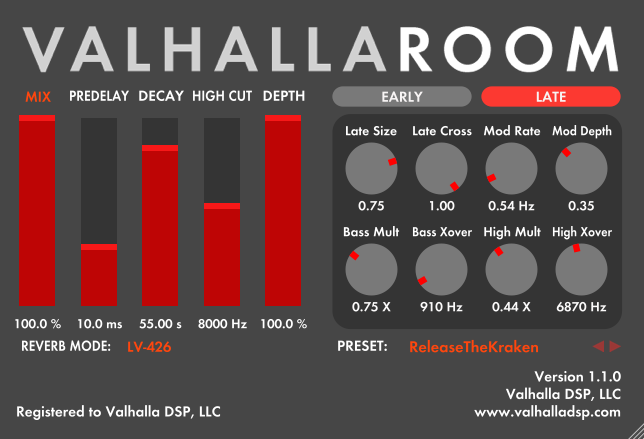 Valhalla DSP has updated its ValhallaRoom reverb effect plug-in for Windows and Mac to version 1.1.0. ValhallaRoom is a versatile, true stereo algorithmic reverb. It features several original reverberation algorithms and has been designed from the ground up to produce a wide range of natural reverberation sounds: small ambiences, warm rooms, halls, plates, cathedrals, and into the void. In keeping with the Nostromo/Narcissus/Sulaco tradition, this is a deep dark space verb. It is kind of a cross between Nostromo and Narcissus, but with a far higher earlier echo density than either of those reverb. LV-426 has a slower attack than the other reverb modes, and a lush, diffuse random modulation that produces beautiful long decays. The LATE LowMult/Xover and LATE HighMult/Xover filters have been moved to a location where they act as tone controls. Values of LowMult less than 1.0 allow you to dial in reverbs with less low frequency energy. The LowXover control can be used to adjust the crossover freq of the low cut/boost. 64-bit VST for OSX. ValhallaRoom is now fully 32 and 64-bit compatible for both Windows and OSX. Optimized CPU for Windows RTAS and VST32. Fixed mono->stereo bypass bug in RTAS. Window resizing bug fixed in Digital Performer. ValhallaRoom for Windows and Mac (VST/AU/RTAS) is available to purchase for $50 USD.